… on foot, that is. Having spent a v. hot day a few days ago discovering the relative cool (24°C/75°F) of the Soulcem barrage (dam) in the Vicdessos valley, we fell in love with the place. 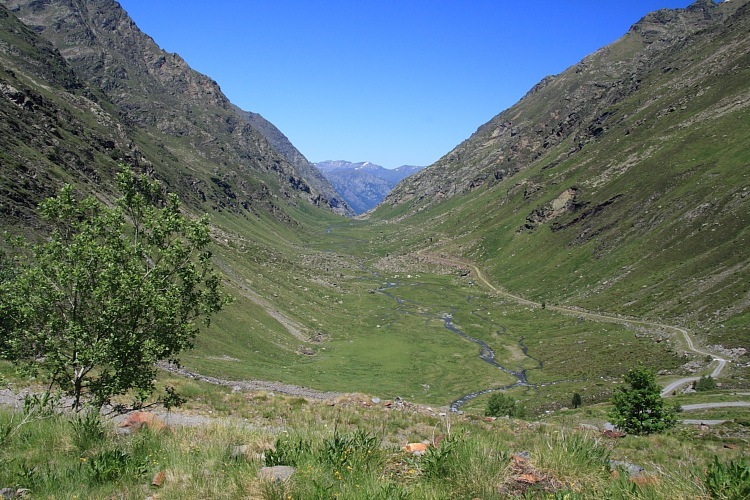 It’s a stunningly picturesque dead-end valley that bumps into the borders of Spain and Andorra which, typically, are on the high points, rising to around 2900m/9500ft, that surround the valley. 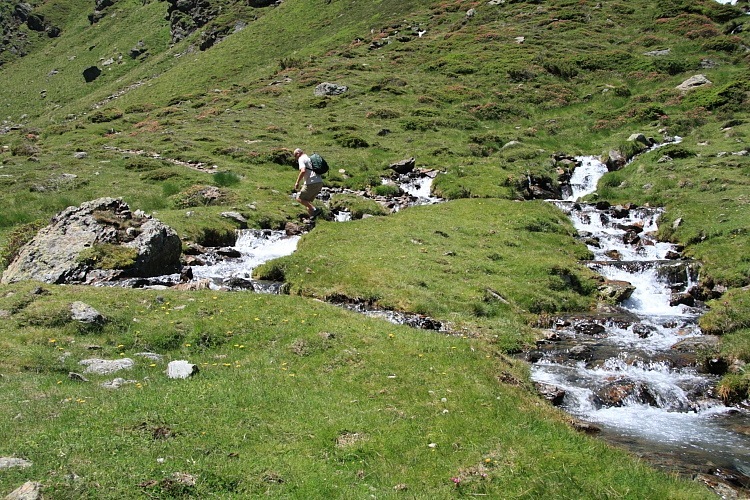 Dead-end, that is, except for a few footpaths including a GR, a Grande Randonnée (long distance footpath), into Andorra. 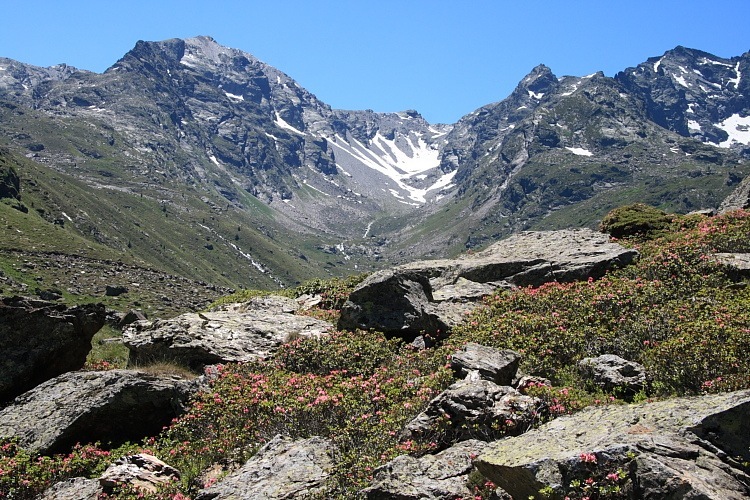 The col (pass) is at about 2500m/8200ft. Another stinky-hot day was in prospect chez nous so we thought we’d return to Soulcem for some more soul-cleansing scenery and more cooling altitude to investigate the GR. I couldn’t go without a camera though because we’re getting into Apollo butterfly season and I’ve never seen one. I lightened the load by taking one wildlife lens, and Francine did likewise by taking just the scenery lens. We then promptly put our loads back up with 750ml water each. Following a leisurely start and 1½hrs driving, we didn’t arrive at Soulcem and begin walking until midday. GRs in France are marked with red and white rectangle markers. We had no trouble following the lower sections ‘cos we’d done it before on our first visit. Thereafter, though, the GR fooled us by having us walk on the west of the valley rather than along the eastern track we had half expected. 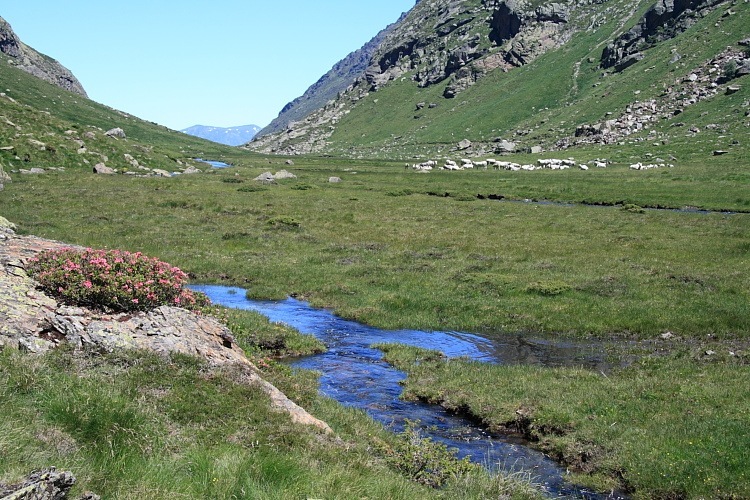 This was a beautiful walk, we even found a pool acting as home to a population of red damselflies, but I couldn’t help but wonder what the GR’s plan was for having us cross the various streams of snow melt water to get back to the east side where Andorra lay. Turns out there was no plan; the GR simply crossed streams and, not being correctly equipped for fording such things, we scratched our heads. After much searching further upstream, we eventually managed our way across using a combination of jumping and stepping on strategically placed stones. We’d made it back to the track on the eastern side of the valley but, with our upstream detours of about ½km, had completely lost the GR markers. The track, however, zigzagged its way up the mountain in the correct general direction. We couldn’t see anything resembling a footpath behind us so we so we set off along the track. After about 1½kms/1ml of reasonably gentle hairpin bends we spied a red and white GR marker cutting off the track and going, effectively, straight up. On the opposite side of the track we spotted a couple clambering up the path we had been unable to see – the way we should have come. “Bother (or words to that effect), that’s where the GR is!” It came very steeply up the side of the valley where we had failed to see a footpath. Time was marching on considerably faster than we were. The GR continued to insist that we ford streams. 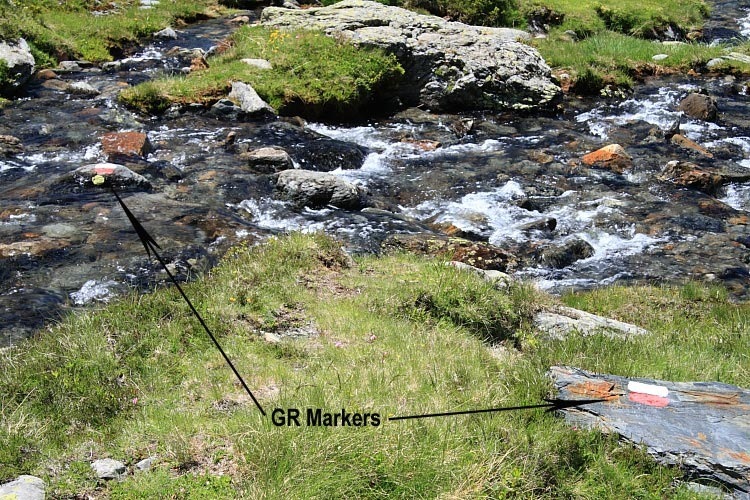 Just to rub it in, one marker was painted atop a rock right in the centre of a stream. Nice! By 3:30PM, the gradient was steep, the going heavy and the end, Andorra, was still not in sight. Though the temperature was only about 25°C/77°F, we were getting uncomfortably low on precious water. The mountain streams were probably safe to drink but there were horses even up here so who knows. Discretion being the better part of valour, we decided to call it a day and just enjoy our remaining water on the downhill walk back. This time we stuck to the GR and it certainly was steep.